Yesterday was the first day of school for Miss A and with that, we officially close the door to summer and start ushering in fall at our house. This means back to a normal routine instead of the hub bub and craziness of summer days and bringing out all the fall decor. I love this part - putting all the vibrant colors and textures in our home to make it a cozy little retreat for those cool days that are coming. 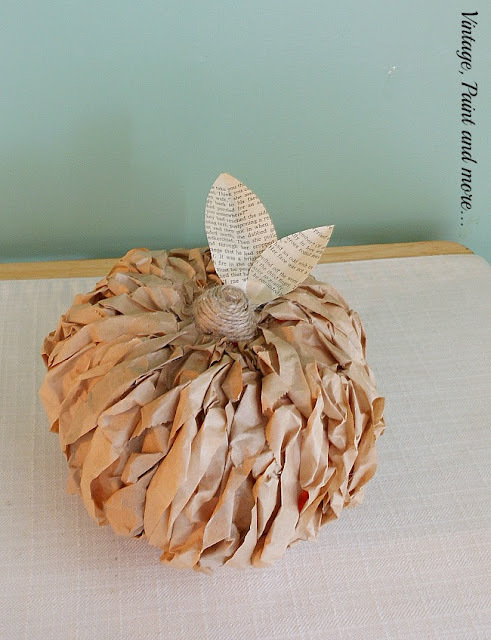 I have been working on several fall projects the past few weeks and will be sharing them with you soon but, today I thought I would reshare a cute little pumpkin that I made a few years back. 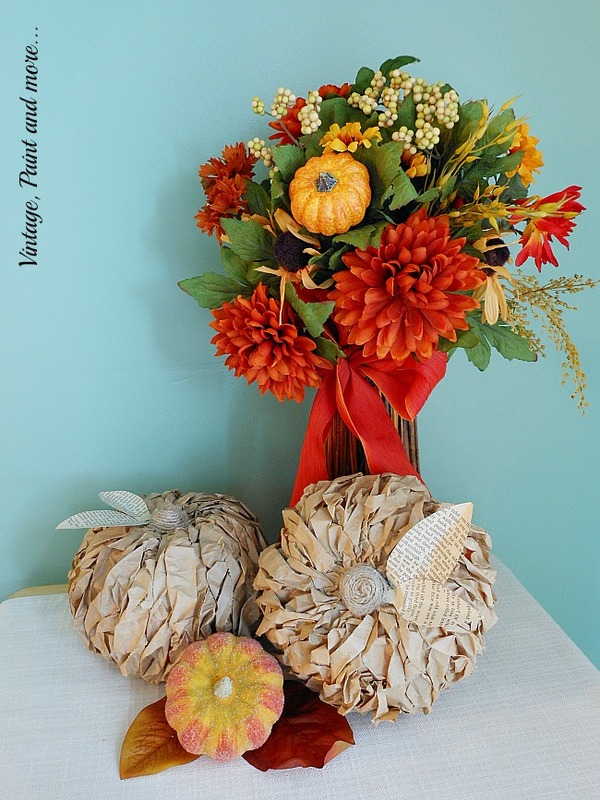 It's a quick and easy project you might enjoy making and will get you in the mood for fall. You may remember these cute little pumpkins but, if you're new here they may be a whole new project for you to try. These little guys are so cute and add a lot of interest and texture to any decor. They're simple to make and take very little time. I made them while watching TV with hubby in the evenings - so no real concentration needed either. The few materials needed are pretty easily found. 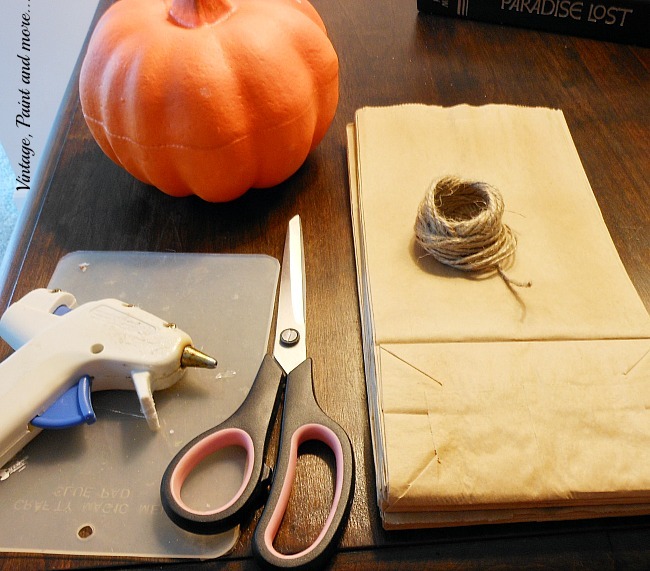 All you need is a Dollar Tree pumpkin, brown lunch bags or any paper of your choice really, scissor, hot glue and gun, and some twine. The complete tutorial can be found here but, the cliff notes follow. 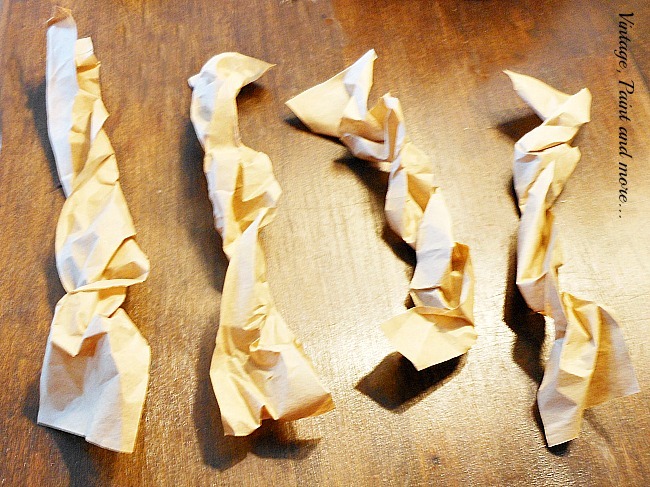 Just cut and twist strips of paper. Glue the strips on the pumpkin completely covering it. When finished gluing the strips on - wrap the stem with the twine and add a couple of leaves if desired. Quick, easy, and so cute. I love the rustic look and the texture the paper gives. I like to mix these with other pumpkins to make vintage looking vignettes. You can use them in your neutral or colorful decors - they fit right in with both. Think you might like to try making your own? 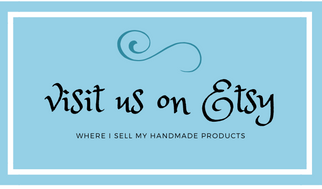 I love to hear from you so tell me about how you might use them in your home. Those little pumpkins are adorable. I love the texture. Thanks for sharing. My youngest daughter loves fall and fall colors. I know she's busy pulling out all her fall decorating items. Have a great week. Thank you so much, Donna. I have been busy pulling out my bins also - but think I am going to scale down a bit this year. Thank you for stopping by. 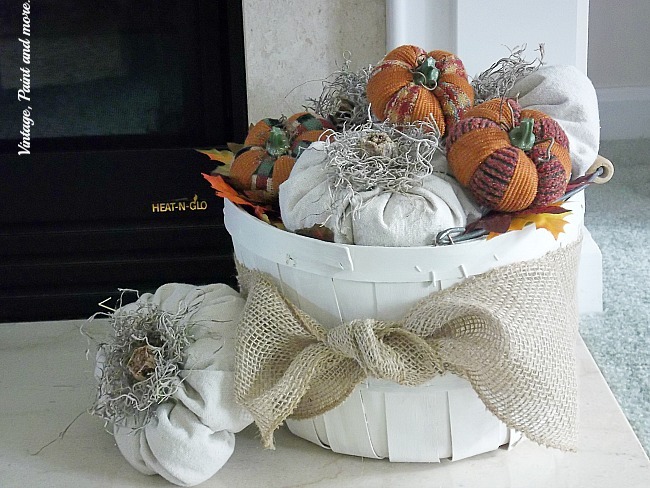 A girl can never have too many different pumpkins for Fall ... and easy too! Yee-Haw! Happy Thursday! I agree - the more the variety, the more the fun. Those are so pretty! Love the twisted look with the newsprint leaves. Visiting from Grace at Home party. Thank you Victoria and thank you for stopping by. Oh my golly these pumpkins are so fun and festive, They look easy enough. Can hardly wait to try them! Saw it on Homestead Hop. Thanks for sharing! Thank you, Cindy. Have fun making them they are so simple and quick. The pumpkins are so cool. The texture is awesome. Thanks so much for a great idea. 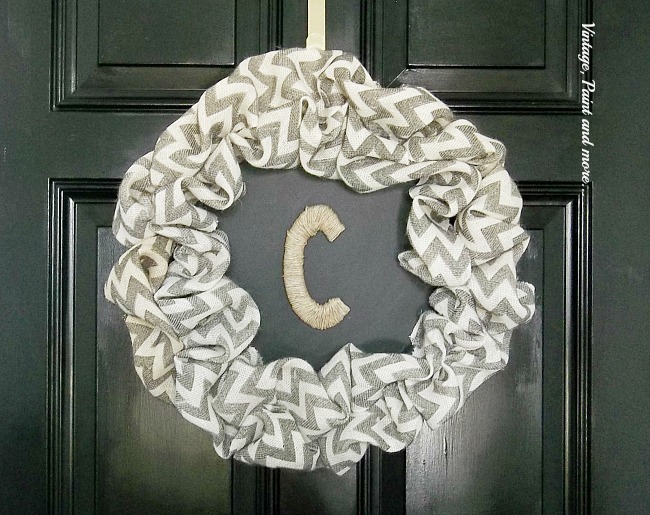 I will definitely making some to add to my fall decor. Thank you. I love these little guys and hope you enjoy making them as much as I did. Really like your little pumpkins. My daughter LOVES to decorate for Halloween and has a pumpkin carving party every year. These would be much easier on arthritic fingers than digging out cold pumpkin guts! LOL - no kidding !! These are great and so unusual that I want one or two in my home! I love how easy they are too. Thank you AnnMarie, I am love how easy they are to make and hope you do also. Wow, this is so cool. 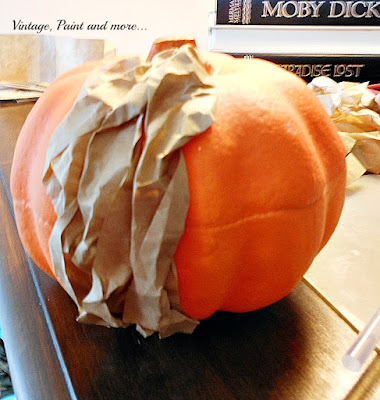 I never would have thought to add paper to the outside of a foam pumpkin. It looks so beautiful. Thank you, Roseann - it is definitely an easy project to do. I LOVE this idea !!! Thanks for much for sharing. Love these Cathy! Thanks for sharing @ Vintage Charm--pinned! Great project! I love the twisted paper pumpkins. Pinning. Thank you Stephanie - hope you have a great time making them. Thank you for stopping by. Well, I'm new here, so this is new to me, and I love this idea! I'm always on the hunt for something easy! Great idea about the twisted paper to use. I throw a ton of it away that comes in packing boxes...shouldn't throw that away! I'm going to start saving it. Welcome and have fun looking around. I love reusing practically anything that's headed to the trash - but, then I get in trouble for saving it all too. Thank you so much for the feature and for pinning it. Cathy, These are really nice! Love them :) Pinned to share. Thank you for pinning it Laurie. 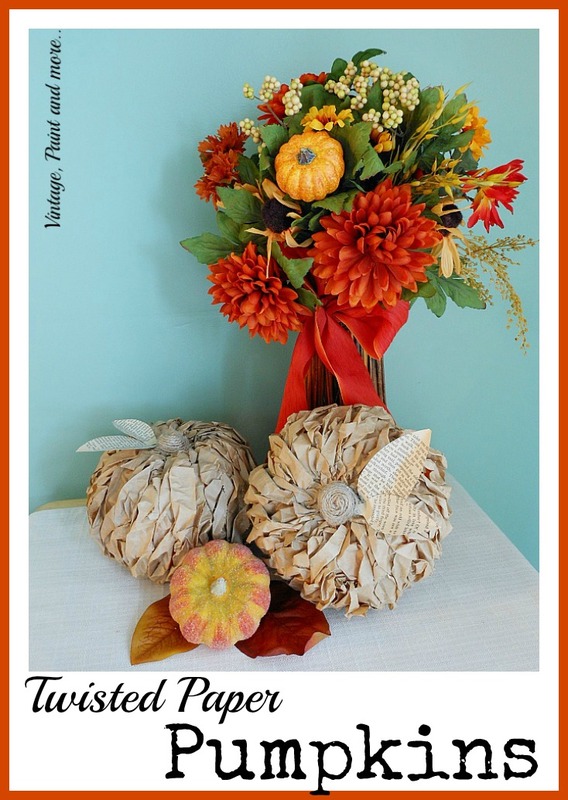 Cathy, I love your twisted paper pumpkins! Thank you for sharing them at the Talk Of The Town Party last week - they are my feature this week! See you at the party tonight and I look forward to what you share with us this week. Thank you for featuring them Marie - I love seeing your party each week - always so much great inspiration there. Just adorable! 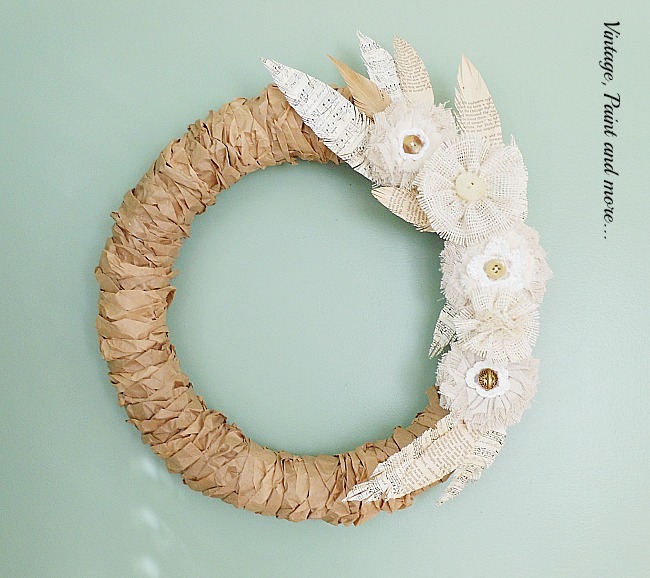 I love the look of these and that I can make them with items I already have on hand! Thank you Lauren. 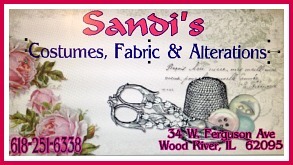 Isn't it great when you already have everything you need on hand to make a new project - I love that.